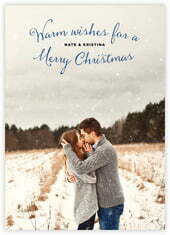 Falling Snow is a romantic holiday card style that places you in a snowy landscape. Upload your photo, and falling snowflakes appear over it, so you look like you are in a world of snow. The message, in a relaxed hand-lettered font, stylishly curves gently above and below your names that are centered across the middle. Photo Tip: Choose a photo in which the top half has a blank, low contrast area such as a grey sky, stone wall, wood, etc. Use an image that is taken in a wintery setting to create a believable snowy winter scene. Customize your Falling Snow christmas photo cards today! Falling Snow Christmas photo cards are flat, with the design on one side that allows room for your personalized text and your choice of colors, and coordinating design on the back. Evermine photo cards come with matching envelopes, beautifully boxed in their own specially designed packaging. And the cards are perfectly ready to use as is, or to be given as a gift. You can also have your envelopes printed with your return address in a letter style to match your cards too. Christmas photo cards measure both 5" x 7" vertically or horizontally, and you have a choice of four papers—our luxuriously thick signature white or cream, signature textured white, or shimmer white. Choose a color, shape and then select the green "Personalize" button to start customizing your Falling Snow Christmas photo cards with Evermine today!